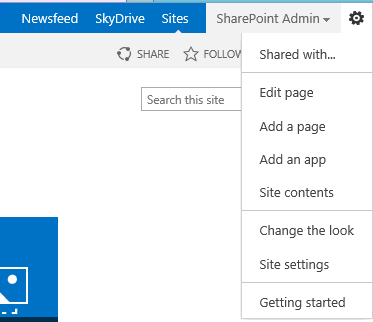 When you try to install Microsoft SharePoint Server 2013 on some Windows Server 2012 configurations, the Products Preparation Tool may be unable to correctly configure and install the required Windows Features for SharePoint. If this occurs, the tool will continuously try to configure and install the required features and then restart. When this problem occurs, the Products Preparation Tool does not progress past the “Configuring Application Server Role, Web Server (IIS) Role” stage. Also, please to note that: Currently, Microsoft SharePoint Server 2013 is not supported for installation on computers running the Windows Server 2012 R2 operating system. SharePoint Server 2013 with Service Pack 1 and SharePoint Foundation 2013 with Service Pack 1 will offer support for Windows Server 2012 R2. These steps will be created using PowerShell Script. In this part, we will deploy an instance of Project Web App along with a Project Web App site in a new site collection. Not all steps in this post are required, such as create Web Application, and/or create Top-Level site collection, but I covered these steps in post for more usability and as a general reference. There are many distributed articles and posts to install and/or deploy Project Server 2013, and I desire to write a full instructions for how to install, configure, and deploy Project Server 2013 step by step using best practices and testing what’s on the internet on my server. And put it all in one place to make it an easy reference for me and my followers. Project Server 2013 enables organizations to get started, prioritize project portfolio investments, and deliver with the intended business value. It’s the flexible solution for project portfolio management (PPM) and everyday work.